We may be semi-permanent travelers these days so it's probably a little snooty to admit that we don’t enjoy huge masses of tourists. But we do avoid those hot spots where possible. We can't help it. Our introverted nature means we seek tranquility. 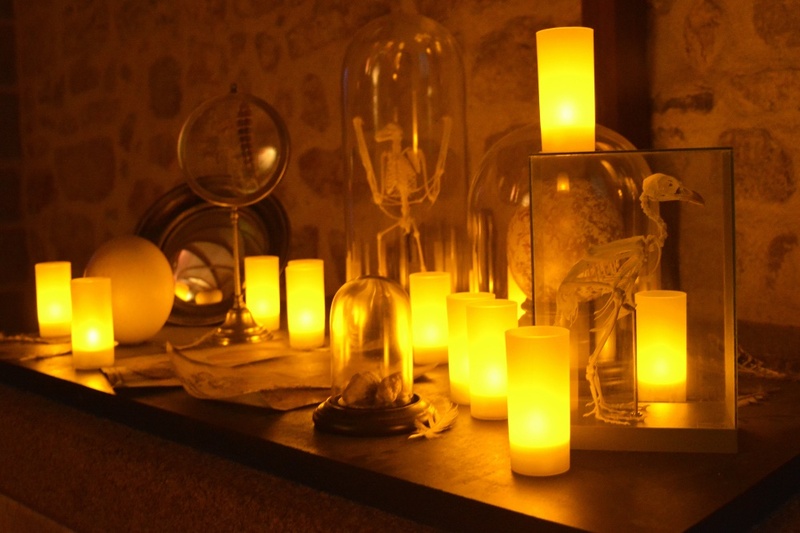 Tranquility is one of many reasons we chose to live in the Vendée. 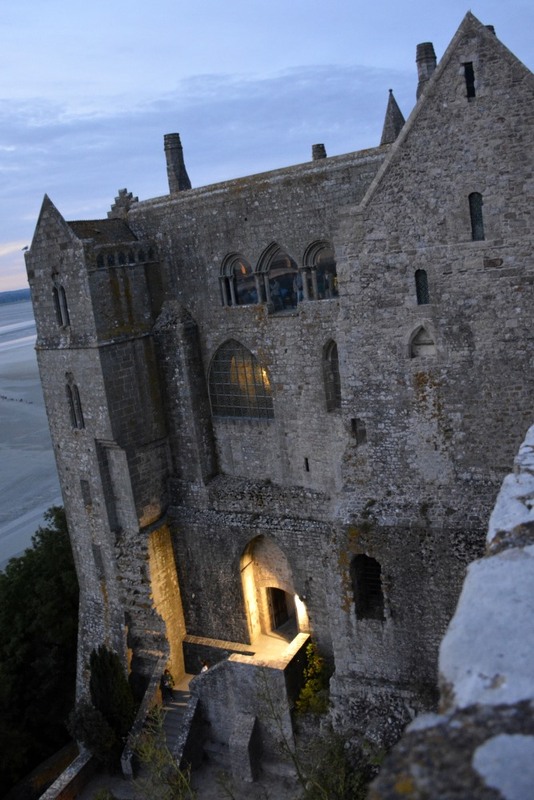 Another is the fact that Le Mont-St-Michel, one of our favourite spots on the planet, is just an easy drive away. With October and Halloween just around the corner, I have been thinking about the last time we visited The Mount. 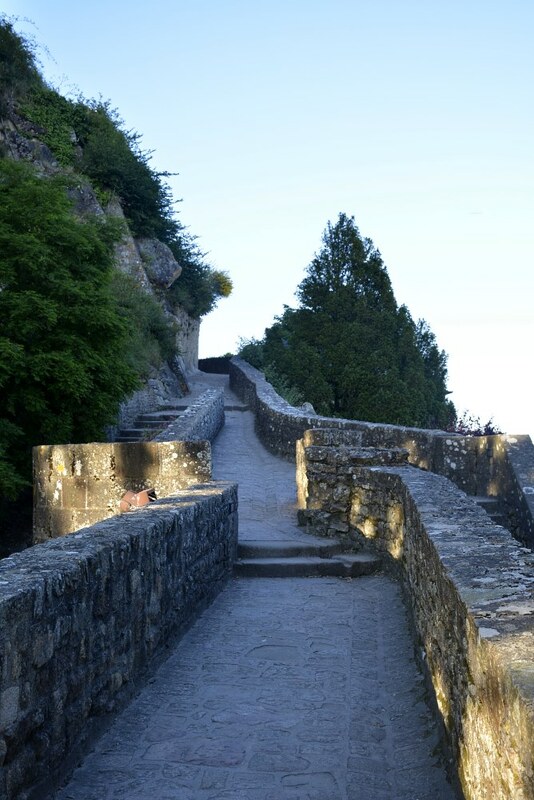 We left late in the day for a romantic dinner there, and were surprised to discover that between 8pm and 8am (20h00 and 08h00), the famous Unesco World Heritage site folds itself back in time all the way to its pilgrimage roots. Before our first daytime experience at Mont-St-Michel, we purposefully read nothing about it. Because we are are avid researchers and readers, and we love history, this was quite contrary to our nature. 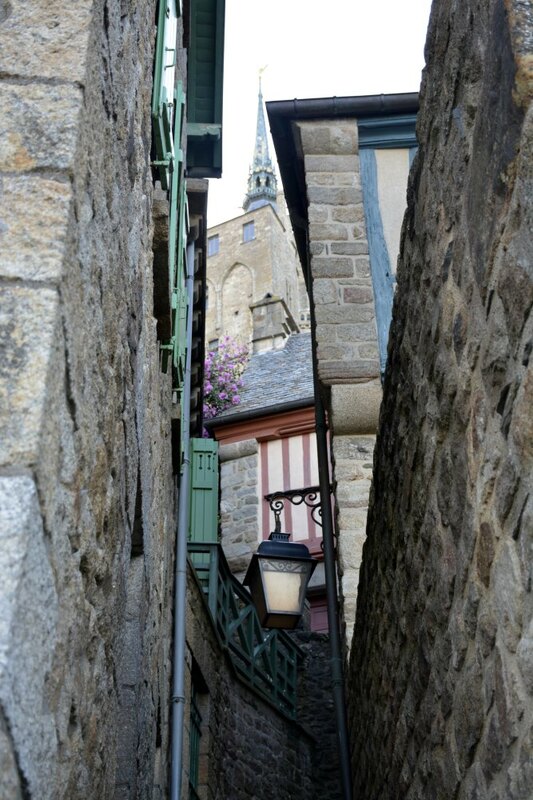 Mont-St-Michel is a place we'd dreamed of visiting, a must-see that was high on our bucket list as travellers. We wanted to be surprised. However, both times we visited there, once alone and once with our family, left us with mixed feelings about it. First, there is nothing that isn't amazing about this place. Superlatives fail me. Wow! The island is small and massive at the same time. It looks tiny in the distance, and yet you can see it from so far away. It was everything we dreamed of. And yet I thought I'd slipped down the rabbit hole and landed in an absolute nightmare. If you spread out the reported 2.5 million visitors per year by 365 days, it would equal 6849 people per day. While there are less visitors in winter time, the island croaks under the weight of tourism in the summer, with averages of 14000 per day. Fourteen thousand! 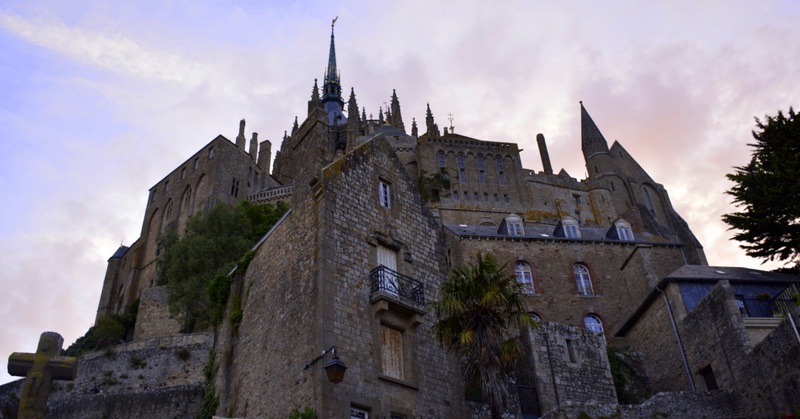 Mont-St-Michel may rise majestically from the ocean floor, but that many people renders the island a mere anthill. It's impossible to breathe. In more detail, the hill has a circumference of around 960 m (3,150 ft), and its highest point is 92 m (302 ft). If all 6849 people were traversing the mount at once, each person would have less than one square meter to stand in. Many of them squatting on rooftops or hanging from trees. You can see why we could hardly wait to return for a nighttime visit. What would it be like? Having carte blanche to explore to my heart’s content, where the possibility of a door left unlocked always exists and would always drive us to explore further, is my idea of heaven. Maybe in another dimension, my name is Alice. I'm always looking to get back to Wonderland. 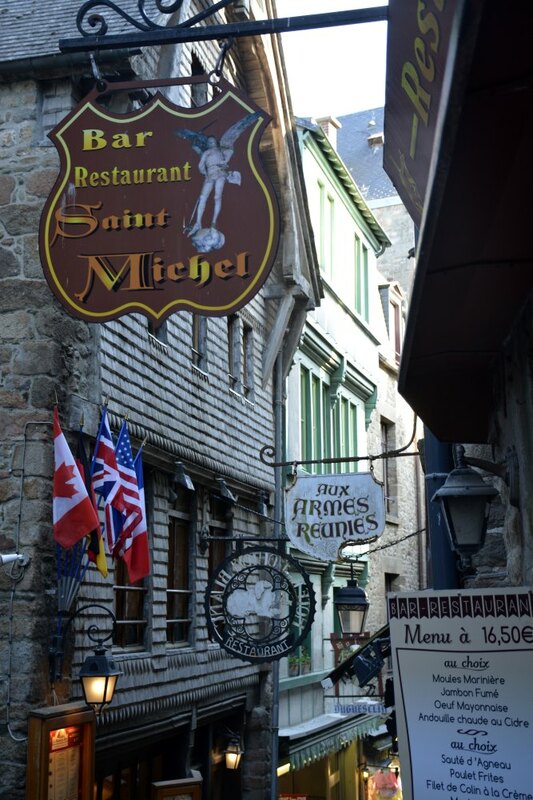 Many don't realise that Le Mont St. Michel is an actual commune. 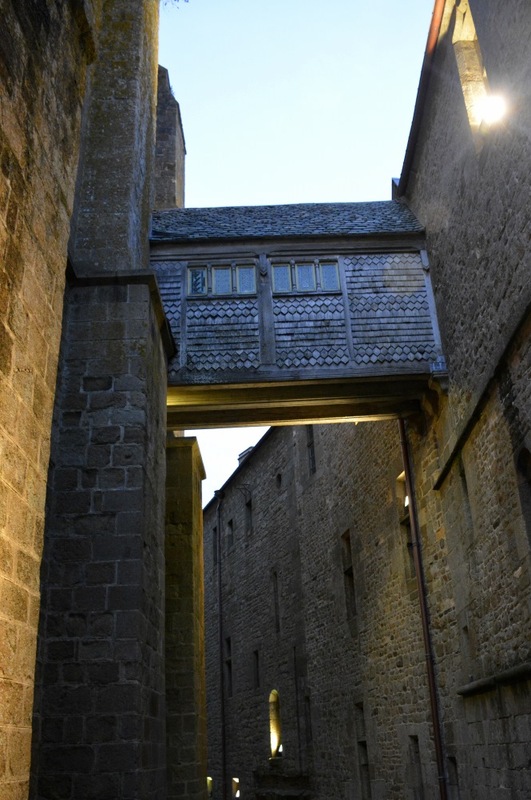 It's a village with a fireman, a (much-criticized) mayor, a post office, a clergyman, a farmer, a fisherman, and a few police officers, and unlike what you might think, there are no opening or closing hours to the fortified village. Only businesses have operating hours, as does the abbey. Around 40 to 50 people live there permanently. There are a number of hotels. Therefor it speaks for itself that respect is of the utmost importance when roaming the streets and steep stairwells in the evening. After our wonderful meal that night, we climbed to the abbey even through it was after-hours by then. We started the ascent through the lower village church, along a narrow cobbled street, and down the little cemetery where we stopped for a chat with the dead. We meandered up narrow alley-stairways, marveled at the tiniest gardens you've ever seen, brimming with bushes and flowers. It was so cool! 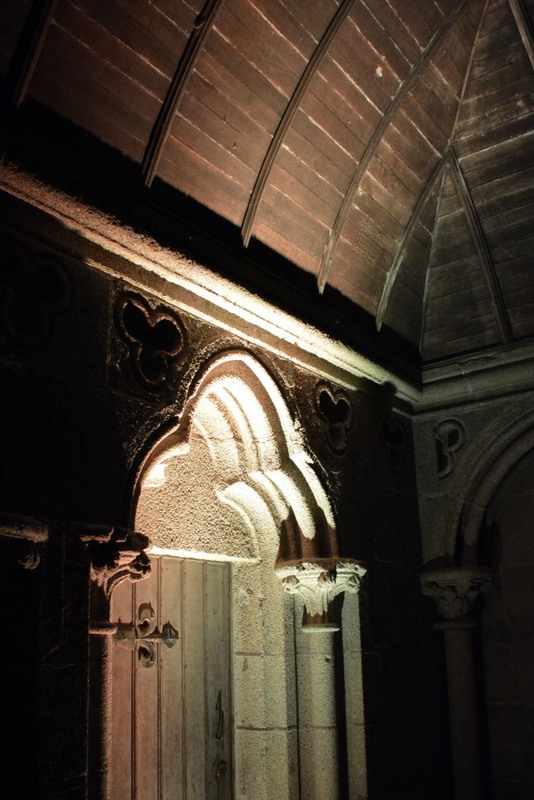 Granted, the “gas lights” are not the tiny flickering flames of medieval times, but it was just brilliant to visit a place that really speaks to the imagination. Without the tourists, we could dart from marvel to marvel like children. I'm sure our eyes were as big as saucers. We greeted every old tree, a pigeon snoozing on a broken terra-cotta chimney pot, navigated the slippery cobbled stairs. 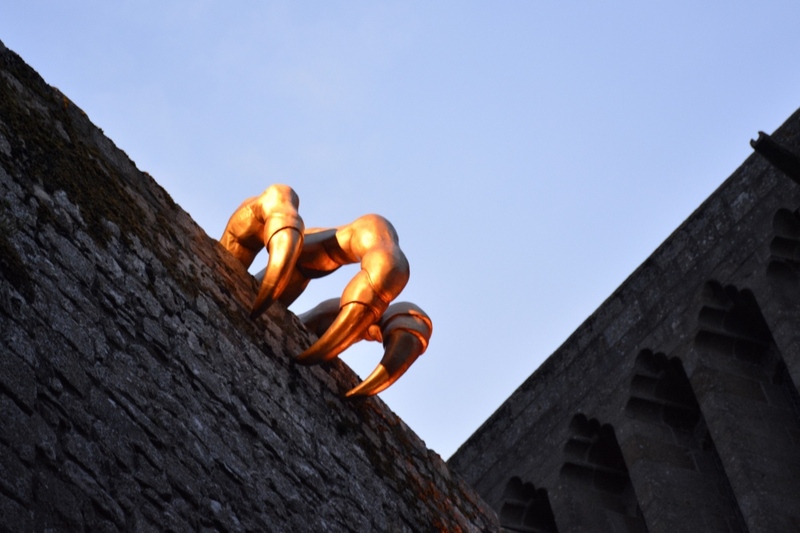 The sun was just beginning to set when we arrived at the old abbey doors. And to our surprise, they stood wide open! As if Michael the archangel himself had done us a favour. We threw one incredulous look at each other. I'm pretty sure my husband’s eyes sparkled away dusk altogether. And me? Well, you never have to ask me twice so we skipped on ahead up yet more sets of stairs as if we were not already completely out of breath from the journey so far. Before we could even purchase tickets, we were welcomed by the first of a creepy cool art installation: the claw of a bird. Or a dragon. 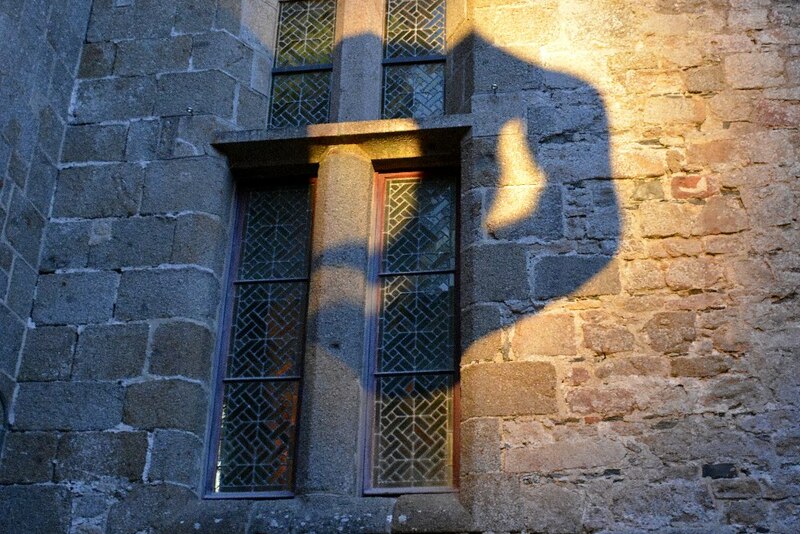 And its shadow on a beautifully textured abbey wall. It was the overture to a symphonic experience on The Mount. Room after arched room, we were met by the sounds of howling wind and unseen creatures flying through the night. 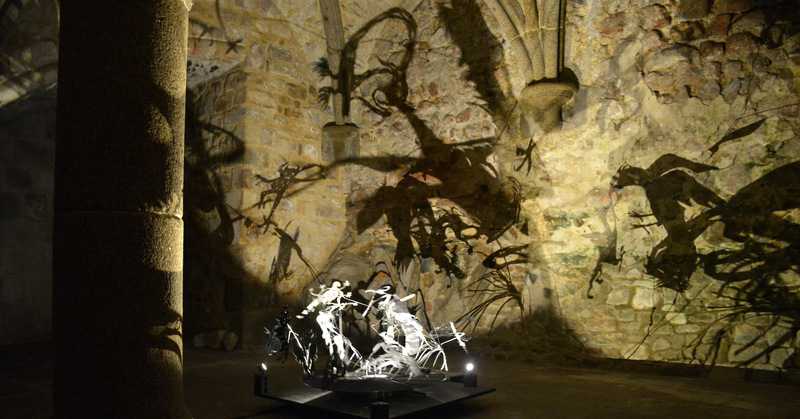 Twisted shadows portrayed the possibility that the abbey was perhaps more threatening than inviting. I thought about Elizabeth Kostova's marvelous book The Historian. I walked around mesmerized by it all. I was holding my husband's hand, but felt completely sucked into the walls and the floors of the abbey. I was a part of the art experience as opposed to being a spectator. Because among the nuances of greens and blues and whites playing on the walls, the creepy shadows, dancing images, and eerie sounds, I was the fifth element. I was the girl the dragons had succeeded in luring into their heavenly den. It was brilliant! But, I was glad for a little respite on the wide open terrace by the grand cathedral atop the mountain. The view across the bay was spectacular! The sun left slivers of pink, stringing together the clouds. The sky’s reflection in the salt marshes below, was nature’s abstract painting. From the ground you cannot see the sea at low-tide. From above, it is clear the treacherous terrain the pilgrims had to brave on their trek to the abbey. I could imagine that after an arduous journey, seeing The Mount ahead must have proffered a false sense of relief and hope. A heavenly mirage. With a deep breath to summon courage, I followed my husband back into the abbey. 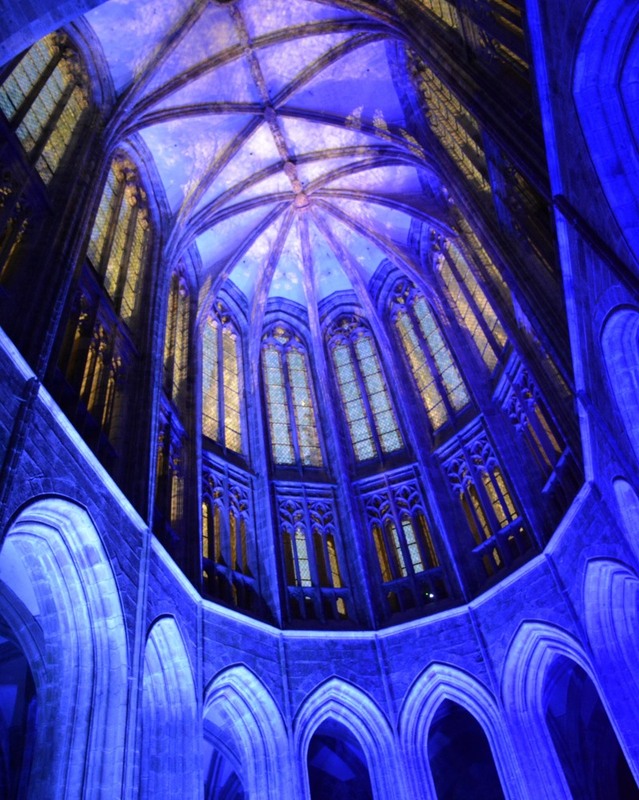 The cathedral’s sanctuary was bathed in a graceful ballet of white and blue light. I lay down on the ancient flagstone floor to steady myself, capturing the scene in a photograph. It was otherwise pitch dark. If someone had tripped over me, I might have screeched the ancient stones into a pile of rubble. Or I wouldn't have cared. I could have laid there forever. I wanted every soul that had ever climbed the hill, had been kept prisoner, had seen the gates of hell and strapped on angel wings, to seep into my body. How many had stretched out there over the centuries? Who were they and what were their aspirations? Why had they made the pilgrimage? Who are the handful of nuns and the monks that currently live in this impressive place, guarding the dragon’s shadows? In the end I was both regretful and relieved to leave the Mont-St-Michel abbey. The art installation managed to evoke a powerful familiarity that will live on in my soul for a long time. Descending The Mount, I considered each step of the stairs, every cobble, the people who shaped them, and the feet that walked them. I'd expected, hoped, the Mount would be very different at night and without shops and tourists to detract from its centuries-old image. More than that, it managed to put me in its pocket and inject a perpetual feeling of wonder. I understood more than ever before that the drive to walk through life with never-ceasing wonder and curiosity in my heart, is my very own pilgrimage.